Its game day everyone at the Steve Omischl Complex! Gold and White Tyke at 6, Gold and White Pee Wee at 6:45, Black and Grey tyke at 7:40 and Black and grey Tyke at 8:30. Swag draw for tonight consists of a Pittsburgh Steelers long sleeve shirt, a Houston Texans hat and some bulldogs swag! $2 each, 3 for $5, or 10 for $10. 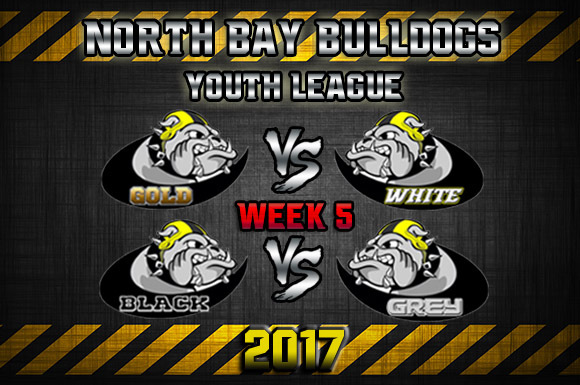 Support the North Bay Bulldogs! We have just over 20 banquet tickets left and they are first, come first serve. $18 each. If the player can not make the banquet please let us know so we don’t end up paying for their seat. I am out of pepperettes at this time, however, have more coming in any day. Stay tuned!